First of all, many apologies to you all and Talktenpin’s Dom Gall. When he first caught me in a weak moment and asked me to write some of my memories of the World Cup, he asked me how many events I had attended, which was the first and which was the last. In that order I said 21, Wembley and Caracas, Venezuela. I recently consulted a listing and found that I had attended 24 events. Wembley was correct as my first but the last was Melaka in Malaysia, one of the most memorable in more ways than one. So, sorry Dom, I should have checked. 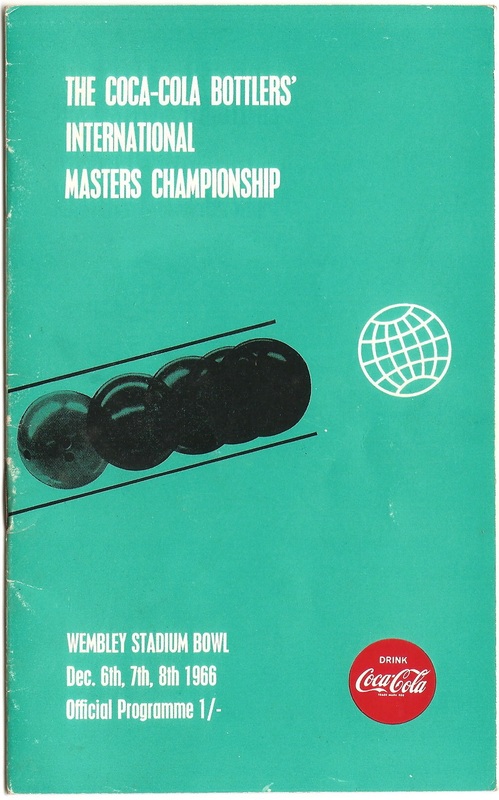 Wembley Stadium was, in 1966, proud to have a great 24-lane bowling centre and an ideal venue to host the second International Masters, just after the neighbouring twin tower stadium had witnessed that inspiring soccer World Cup win for England over Germany. The inaugural event in Dublin in 1965 attracted a field of 20 players, all male as women didn’t enter the fray until 1972 in Hamburg, Germany. 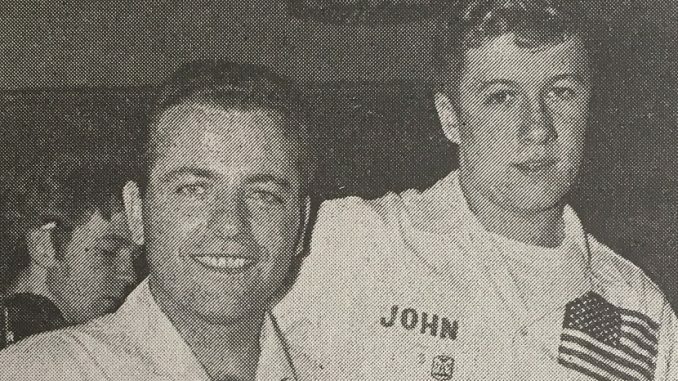 Wembley brought the total up to 24 and Great Britain’s hopes of glory rested on local hero Chris Buck, a young lad who was to blaze a trail of fame across Europe and even a successful spell on the Professional Bowlers Tour in the United States. 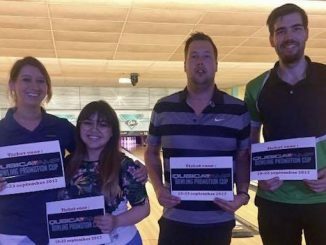 Chris was recently inducted into the UK Tenpin Hall of Fame. 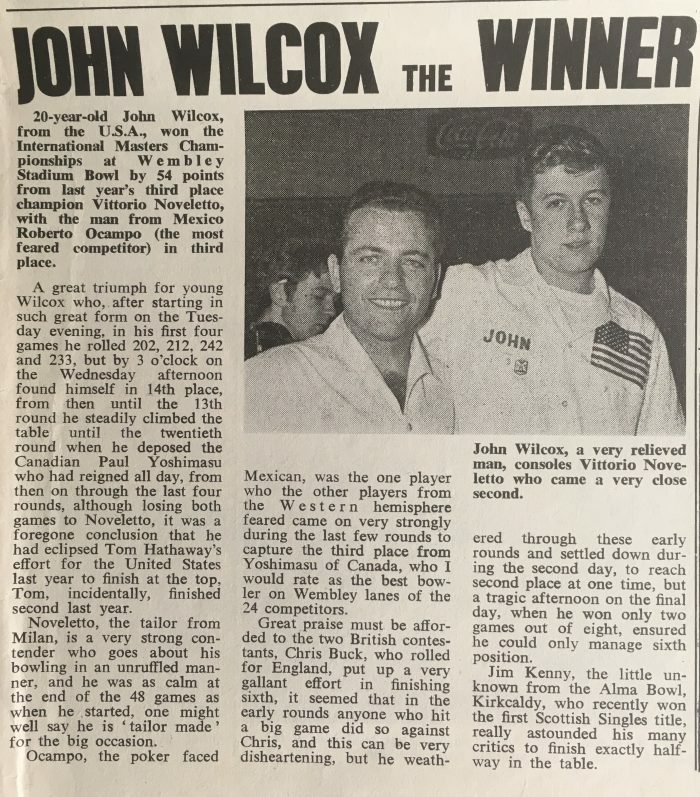 It was a gallant fight for Chris against a highly talented field but it was John Wilcox of the United States who won America’s first tournament victory and Vittorio Noveletto of Italy, who placed second in Dublin, repeated that feat in Wembley. Third place went to Roberto Campo from Mexico. Chris Buck came home in sixth place, himself slightly disappointed, but quite an accomplishment. 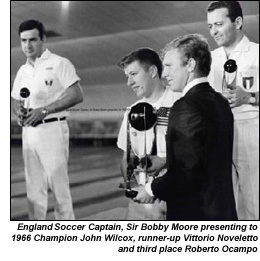 It was a great honour for John Wilcox to be presented with the Cup by England soccer captain Bobby Moore. Defending champion Lauri Ajano of Finland finished in 17th place. 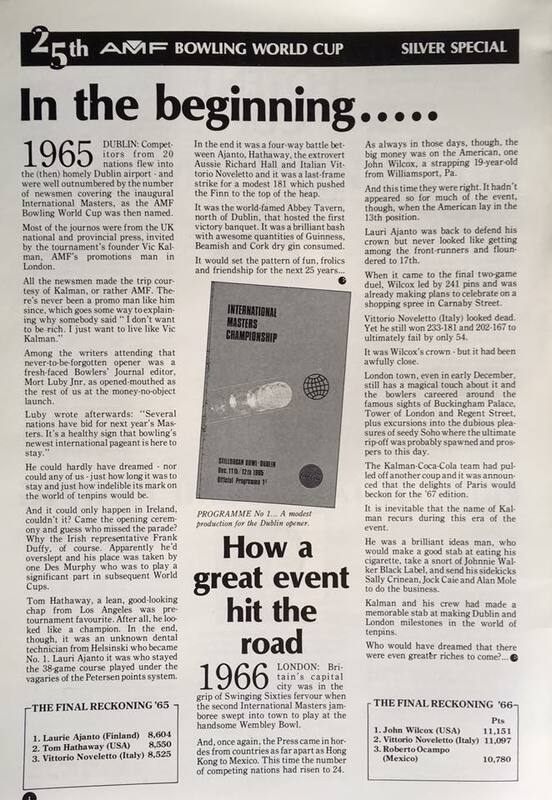 The tournament attracted great media interest, both at home and abroad, as tenpins enjoyed good coverage on television and in newspapers in those ‘good old days’. I still have the sponsors Coca-Cola’s souvenir fruit knife as part of my World Cup memorabilia, although I cannot ever remember using it. Wembley Stadium Bowl has loads of memories for me as I bowled there frequently and in the early 70s general manager Ralph Miller asked me to take over the pro shop and I ran that until the centre closed. 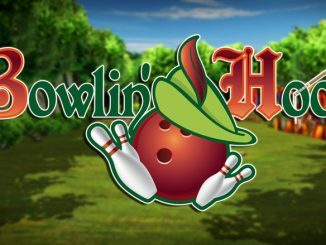 Since the first event in 1965, winning AMF’s Bowling World Cup title has been the most coveted goal in amateur bowling. Whether held in the shadows of the Great Pyramids in or under the bright lights of , each tournament has provided unforgettable moments from competition that has spanned five decades. 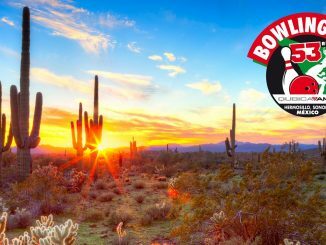 Browse the archives to discover or revisit these moments, competitors, and the great champions that have made up the rich history of AMF’s Bowling World Cup.